Hi loves! How are you today? Hope you are having a great week. Today I have something to show you I was very proud of. My first (succesful) splatter manicure! I was so happy with the outcome and received quite some compliments on these nails. I used polishes from 2 sets provided by The New Black. The sets are "Shibuya" and "Noble Spirits" from the Digital Underground collection. From the first I used the cream basecolor, and from the second the orange and blue color. Sadly the individual polishes don't have names nor numbers, so keeping the set together is the best way to be able to tell which polish it actually is. I started with 3 coats of the cream basecolor. For the color it is it actually applied quite well, yes it is a bit streaky but nothing that can't be fixed with topcoat. It wasn't patchy so that's nice. If you have a steady hand and take your time 2 coats probably will do just fine. For the splatter I started with the blue, because it is the darkest color. I taped off my fingers as much as possible to avoid huge cleanup and that worked good! 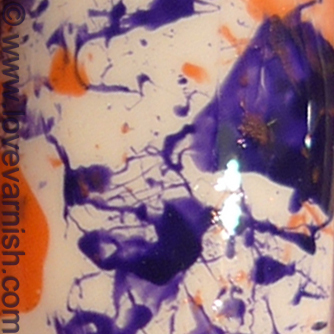 Tell me, do you like this splatter? And do you have any experience with The New Black polishes? You can find The New Black in their webshop. They are also on Facebook, Twitter, Instagram and Pinterest. This looks so awesome!!! I love the colors you used and your splatter is great!! 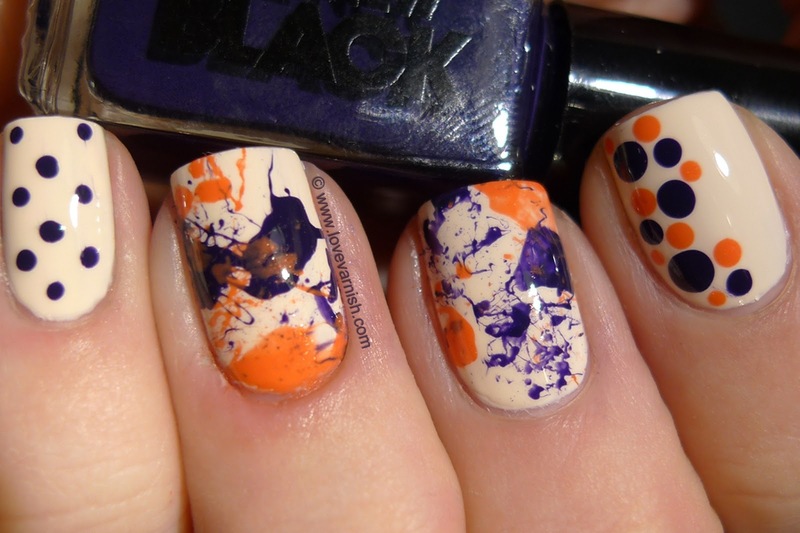 I love the splatter, but the dots on the index nail is are also amazing. Just awesome colors together! Cute combo of splatter and polka dots, very cute! I love the colours you chose! They are perfect together. and I really like the dots! 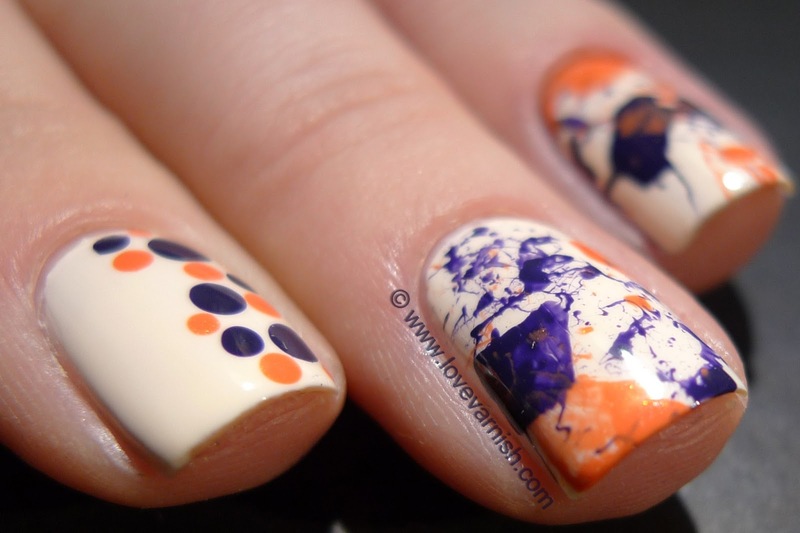 Oh I LURVE your splatter! I will try this soon...maybe this weekend! Awesome!!! I love both dotted and splattered nails here... The colour combo is great!!!! Thanks Marisa! I was very happy with how it turned out :). Thanks so much dearie ♥! Aww I like cheesy ;-). And I like your comment, thanks so much! You should! So much fun ♥. Ooooh try eeeetttt! It is great :D. Thanks Liz ♥. Oooh that's sad :(. Maybe try a third time ;-)? Thanks babe :D! Ik was er ook behoorlijk trots op :D! Thanks so much! Yes the colors are just perfect for each other :). Thanks Gwen, I loved it too :D.
Thanks Cait! Yes the went so well together.